Season chicken with 1/4 tsp. garlic powder and 1/8 tsp. each salt and pepper. Place in a large sealable container (or bag). In a small bowl, mix 2 tbsp. teriyaki sauce with 2 tbsp. orange juice. Add to the container, and thoroughly coat chicken. Seal, and refrigerate for 1 hour. To make the sauce, in a small bowl, mix remaining 1/4 cup teriyaki sauce with remaining 1 tbsp. orange juice. Bring a wok (or large skillet) sprayed with nonstick spray to medium-high heat. 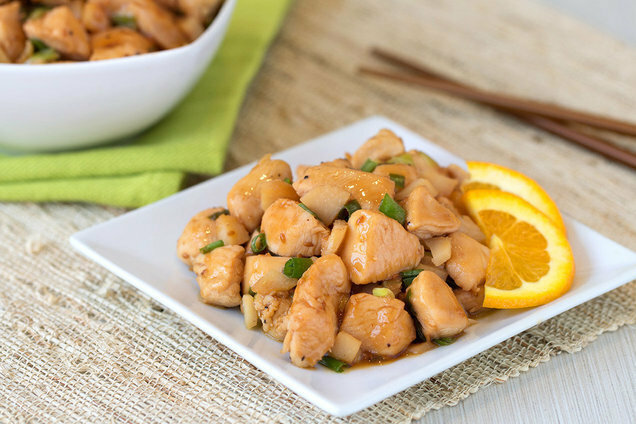 Cook and stir marinated chicken for about 8 minutes, until fully cooked. Reduce heat to medium. Add sauce, chopped water chestnuts, and scallions. Cook and stir until hot and well mixed, about 2 minutes. Using a spiral vegetable slicer, cut zucchini into spaghetti-like noodles. (If you don’t have a spiral veggie slicer, peel zucchini into super-thin strips, rotating the zucchini after each strip.) Roughly chop for shorter noodles. Bring a wok (or large skillet) sprayed with nonstick spray to medium-high heat. 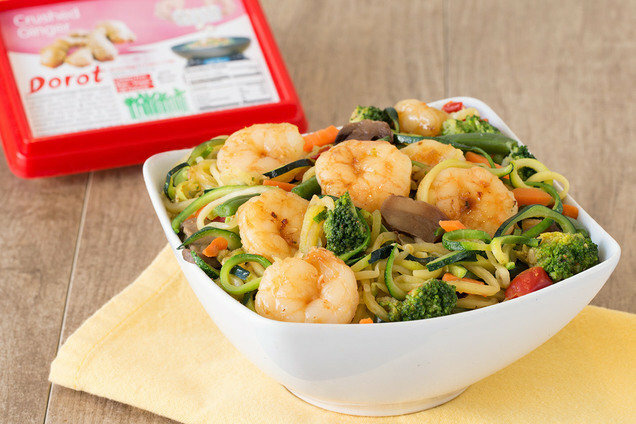 Add frozen veggies, shrimp, and ginger cube. Cook and stir until shrimp are fully cooked, veggies and ginger have thawed, and excess liquid has evaporated, about 4 minutes. Add zucchini noodles, and cook and stir until slightly softened, about 3 minutes. Remove from heat, and stir in teriyaki sauce. Help your buddies out -- click "Send to a Friend" and be their mealtime hero.